Details relating to the Portuguese Commemorative of 2007. 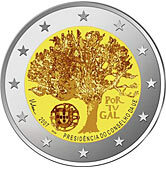 This is the first commemorative coin issued by Portugal and is to celebrate their presidency of the Council of Europe. The motif in the inner circle shows an oak cork tree as well as the Portuguese coat of arms which appears under the cork tree on the left hand side. On the right hand side PORTUGAL is shown in three lines, one under the other. The cork tree is a perennially green tree that is drought resistant and demands little of the soil – so environmentally friendly and symbolic of what the EU aspires to be. Around the lower edge of the inner circle we have around eight o’clock I. Vilar (the name of the designer), followed by the year of issue 2017 and mint mark and finally by the inscription “PRESIDÊNCIA DO CONSELHO DA UE”. From Portuguese Commemorative 2007 to euro coin collector.